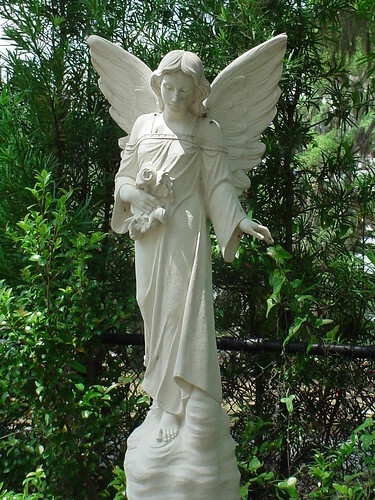 Visit Bonaventure Cemetery while staying at our Savannah Vacation Rentals. Spanish moss drapes from the massive old Live Oaks in Bonaventure Cemetery, casting shadows on the funerary statues and tombs. It is truly a hauntingly beautiful place; people who visit Bonaventure Cemetery don’t soon forget it. If you’re planning a trip to one of our Savannah Vacation Rentals any time soon, consider adding Bonaventure Cemetery to the itinerary. Bonaventure sits on a bluff overlooking the Wilmington River, as it has since it’s creation in 1868. It is a vast and lush place. A few famous people are buried here: such as singer and songwriter Johnny Mercer, author Conrad Aiken, and Governor Edward Telfair. But it is the landscape and the statuary that are most captivating. The cemetery is large enough to merit a car, but you’ll want to get out and walk among the tombs frequently. Tours are available through several companies in town: Savannah Tours, Bonaventure Cemetery Tours, and Tour Bonaventure. Without a tour, it’s easy to wander through Bonaventure for hours. Bonaventure Cemetery is worth a look, no matter what brings you to our Savannah Vacation Rentals.